Absolute perfection! 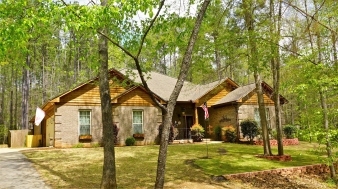 Beautiful brick Harris County home in convenient location. Remarkable chef's kitchen boasts granite counters, KitchenAid stainless appliances, large center island and views the fireside family room. 4 bedrooms, 2 baths. Master suite offers separate tub/shower and double vanities. Granite counters in both baths. Enjoy the serene setting from the fabulous screen porch. Fenced yard and storage shed.